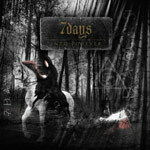 The ever busy composer, guitarist, and graphic designer Markus Sigfridsson (Harmony, Darkwater) returns with his 7 Days project and sophomore release Into Forever. As usual Mr. Sigfridsson has organized some fine talent to accomplish the task, including Daniel Flores (d, Murder of My Sweet, Mind's Eye), Kaspar Dahlqvist (k, Stormwind, Dionysos), Andreas Passmark (b, Royal Hunt, Narnia), Thomas Vikstr�m (lv, bv, Therion, Stormwind, Candlemass), Caroline Sigfridsson (lv), Christian Liljegren (v, Divinefire, Golden Resurrection, Narnia), and Erik Tordsson (lv, bv). The result is that Into Forever is another epic platter of melodic heavy metal. With larger symphonic ambience and deep vocal arrangements, it appears Sigfridsson wanted the atmosphere of Into Forever to be more grand and sweeping than 2006's Weight of the World. Through the Dark and Light and Scattered Mind find the traditional heavy/power metal buoyed by this very atmosphere. Conversely, Enter a Dream charges along almost entirely on the juggernaut of classic European power metal. Then, We Cry No More and Under the Sun strikes a balance between pure melodic heavy metal and power metal, with the symphonic notes more subtle but still effortlessly persuasive. Throughout Into Forever this mixture of forms adds intrigue from song to song. Yet, it's possibly best displayed in the epic, nearly 20 minute, melodic metal mastodon Final Wisdom. This is Sigfridsson at his most profound and elegant best. If you aren't swept away by this symphonic progressive metal tidal wave, then you need to check your vitals. While some will dismiss 7 Days' Into Forever as typical Scandi melodic metal extravagance, you cannot as easily deny the genuine craft and creativity of its creator Markus Sigfridsson and his talented cast. Into Forever is a solid work of epic and engaging melodic heavy metal.